Some days our homeschool gets off track. My son dropped his laptop on the floor, breaking the LCD screen. Everything else is fine, but the screen is gone. Most people take their laptop problems to the Apple Genius guy and have him do this complicated repair. But fortunately, I've done this before and I had the spare parts from another one to use. I didn't have to buy a thing. So, our schedule for the day? 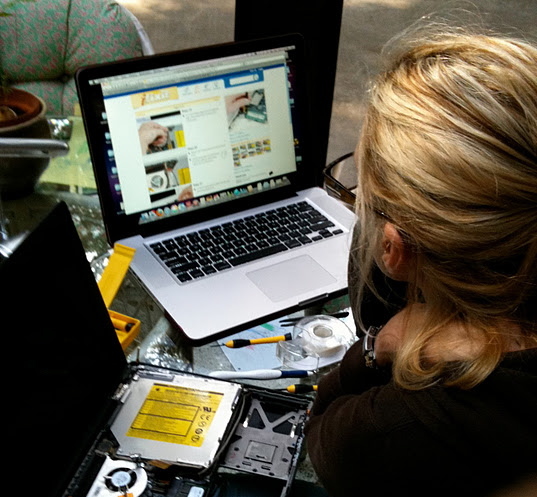 What's inside your laptop and how to repair it. Good news too, I found a youtube that demonstrated a shortcut. I sort of stumbled across it. This saved me hours and hours. I didn't have to take the whole thing apart. It was a little tricky and somehow my Tom Sawyer spirit was contagious because before I knew it, my older son wanted to help. With his younger eyesight he did the complicated part of plugging in the little plug thingy in the circuit board hidden in the hinge cover. The one thing my homeschooled son learned? "Wow, this is the inside of my laptop?" Once I had it open I saw fear on his face -- mom could totally blow this. All's well and he is up and running again.